Science as an intellectual exercise enriches our culture, and is in itself ennobling. The benefits of science are not to be reckoned only in terms of the physical. Taube's win was the first for an inorganic chemist since 1913 (Alfred Werner) breaking a long string of awards to organic chemists. He used isotopically labeled oxygen-18 and radioactive chlorine to study these reactions. His students have had faculty positions at many prestigious universities including Cornell Rutgers Georgetown and Georgia Tech.
" 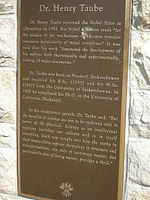 He was the first Canadian-born chemist to win the Nobel Prize. Taube and his wife Mary had three children his son Karl is an anthropologist at the University of California Riverside. After finishing graduate school Taube worked at Cornell University the University of Chicago and Stanford University.